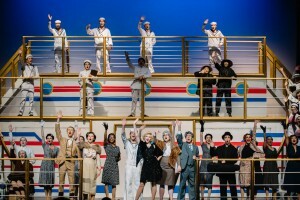 Bon Voyage performed by sailors and passengers, with Reno Sweeney (Sara Sargent). Photo taken by Iris Longoria. 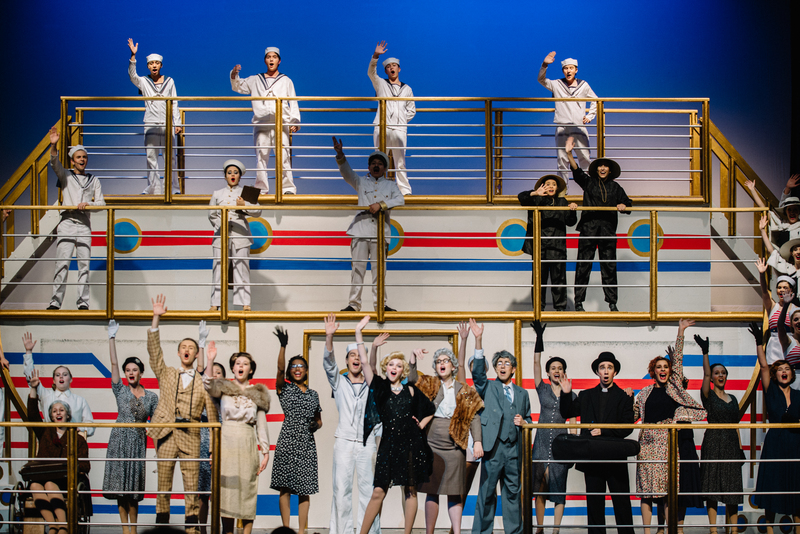 As a kick-off for their 18th year of musical production, NESA’s Musical Theater, with Visual Artists, Instrumental Music, and Technical Theater, Anything Goes was shown starting Thursday, Nov. 6 to Sunday, Nov. 9. The performers and musicians were given a three day break, and were at it again Thursday, Nov. 13 to Sunday, Nov. 16. The musical comedy is based off of Guy Bolton, P.G. Woodhouse, Howard Lindsay, and Russel Crouse’s book. The show is about a handsome young Wall Street broker, Billy Crocker (Preston Perez) reuniting with a girl he met in a taxi, heiress Hope Harcourt (Noa Barenblat, Aria Braswell) on ocean liner, SS American, bound from New York to London. However, Billy is actually supposed to be on Wall Street, making sure business is going right for his boss, Elisha Whitney (Marcos Ramirez), who is preparing to make a business deal in London. Billy goes to the dock to say goodbye to his boss and his friend, nightclub singer Reno Sweeney (Sara Sargent), who has feelings for him. While giving his farewells, he catches a glimpse of his love-at-first-sight, with her fiancé Lord Evelyn Oakley, and her mother, Evangeline Harcourt (Juilenne Bajusz). With his heart set on Hope, Billy stows away on the ship in high confidence of winning her over. But what’s a good love story without some helpful friends? A second-rate gangster labeled “Public Enemy 13”, ‘Moonface’ Martin (Casey Conner) and his girlfriend Erma (Lizzie Poncio, Yleana Wooten) are befriended by Billy, disguised as a minister and a missionary. To help Billy out with his stow-away problem, Moonface and Erma give him the ticket and passport of their leader, Snake-Eyes Johnson. With that, the trio keep in disguise, and plan to get Hope and Billy together, as well as arrive to London. I Get A Kick Out Of You performed by Reno Sweeney (Sara Sargent). Photo by Ryker Allen. 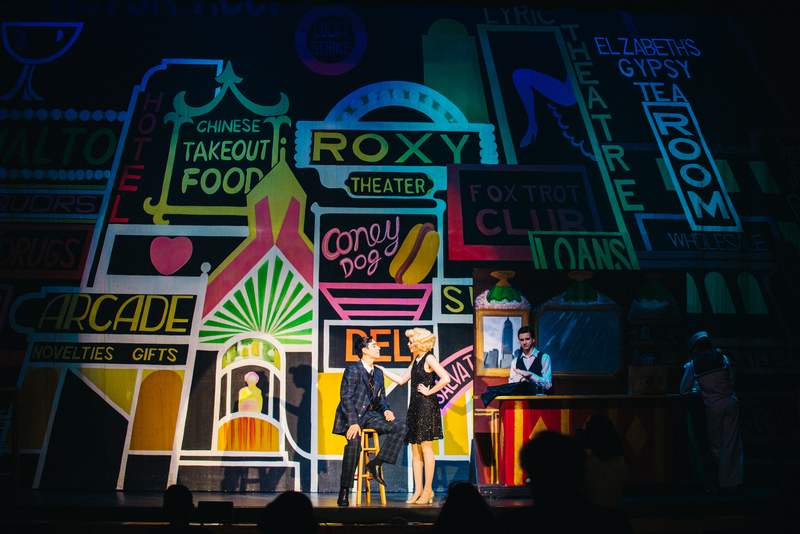 Thanks to the amazing and talented visual artists, the first scene in the bar, as well as SS America were beautifully brought to life, and could be admired from the back of the auditorium. Some would say the art was ‘de-lovely’. Costumes and props were also immensely admirable, with sharp sailor suits to the elegant dance dresses, thanks to the Costume coordinator, and to all the Costume moms and students. With the Technical crew and Technical Production Crew on top of things, the heart-felt and/or humorous solos and duets like I Get A Kick Out Of You, You’re The Top, Easy To Love, and every single performance had their meaningful moments bright for the crowd to feel like they too were on stage, in the act. And speaking of those solos and duets, heads were nodding and foots were tapping to the beats of each and every song, thanks to the phenomenal orchestra, conducted by Mark Twehues. Before each act started, the audience sat in darkness, listening to the lively and cheerful introduction. Throughout the show, the orchestra performed astoundingly, and helped with each significant moment the actors preformed. Whether attending a Thursday show, or a Sunday one, each and every actor performed beautifully, causing the audience to whistle, cheer and laugh with all the witty jokes, or even certain facial expressions. 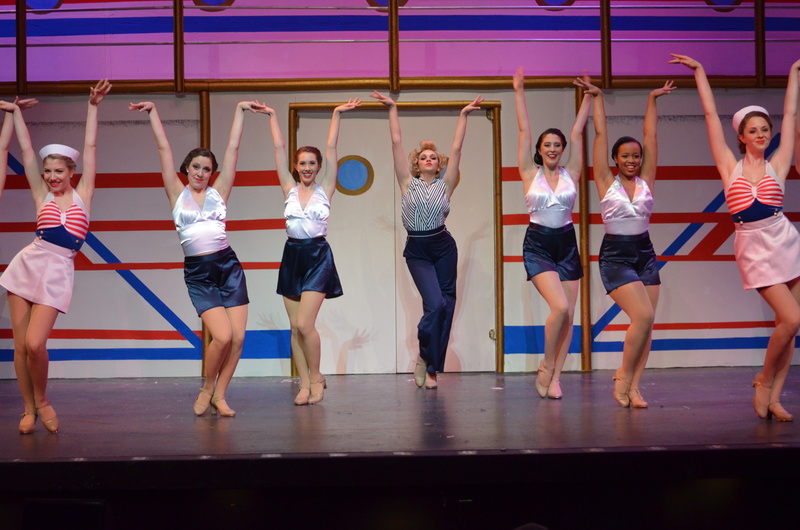 Directed by David Connely, and choreographed by Dena Mabry, with Stage manager Brittany Lopez helping out behind the curtains and set, Anything Goes was just one of those plays anyone can ‘get a kick out’ of. Reno Sweeney (Sara Sargent) and the four Angels with sailor girls performing Anything Goes. 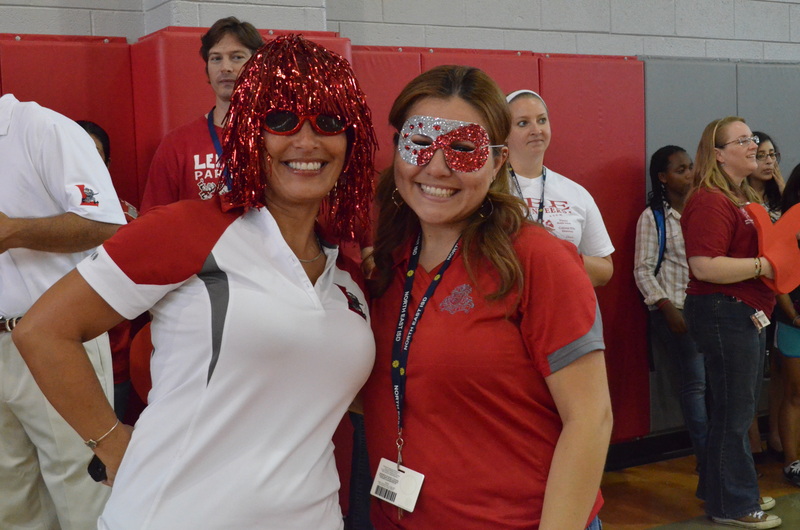 Photo by Iris Longoria.